At the conclusion of Beyond the Trailer on speculative fiction nominees at the MTV Movie and TV Awards, I told my readers to "stay tuned for the box office for 'Deadpool 2' and 'Solo.' Star Wars!" 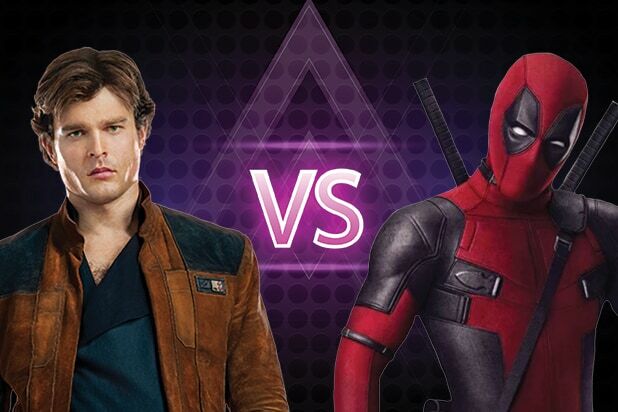 Wochit Entertainment sets up the rivalry in Will Deadpool 2 Beat 'Solo' At The Box Office? That won't happen this weekend, as "Solo" is number one at the box office. However, when one compares opening weekends, the return of The Merc with the Mouth beats the Han Solo origin story handily. The Hollywood Reporter figured out as much on Friday in Box Office: 'Solo: A Star Wars Story' Struggling to Hit $110M in U.S., Crashes Overseas. Disney and Lucasfilms' 'Solo: A Star Wars Story' is struggling in its debut at the Memorial Day box office, where it could come in well behind expectations with $105 million-$110 million for the four-day holiday weekend unless traffic picks up in earnest on Saturday. The projected three-day weekend tally is $80 million-$90 million. As Forbes reports, the actual tally for Friday through today (Sunday) is $83.3 million and the projected total for the holiday weekend will be $101 million. Yikes! That's a lot lower than any of the projections. Follow over the jump for analyses of "Solo" becoming a box office disappointment. Let me revisit a prediction I made in Drink to 'Avengers: Infinity War' having the best opening weekend box office of 2018 so far. I don't expect that "Solo," this year's Star Wars movie, will fare as well, making this the first year in four years that a Star Wars film is not the box office champion. I still think it will be a hit, but $350-400 million isn't even in "Rogue One" territory. Disney won't be upset about that, either. On the one hand, I was right; "Solo" opened below "Rogue One." On the other hand, "Solo" is in more trouble than I expected and Disney will likely be upset about it. I'll let Scott Mendelson of Forbes give the bad news. But when your $250-$300 million (thanks to reshoots) sci-fi prequel opens with $101m over four days with a lower weekend multiplier than X-Men: Apocalypse, with awful overseas numbers to boot, the odds are beyond grim. Yes, the reviews are decent and the next two weeks are relatively vacant. But even and [sic: an] arguable best-case-scenario of a 2.5x multiplier (think Men in Black 3 in 2012) gives the Ron Howard-directed film a domestic total just over/under the $248m debut weekend of The Force Awakens. And there is plenty of precedent for a much-grimmer outcome. That weekend multiplier is terrifying because there are plenty of big Memorial Day releases (the third and fifth Pirates movies, the last three ensemble X-Men flicks, Day After Tomorrow or Fast and Furious 6) that barely earned over/under 2x their four-day gross over their entire domestic run. Yes, there is math that argues that Solo: A Star Wars Story may end up essentially earning about what The Amazing Spider-Man 2 ($202 million) or Godzilla ($200m) did in 2014. And unlike those franchises, Lucasfilm can’t count on an overseas bailout. The range from $200 million to $250 million matches my estimates of the box office total for "Solo" as well. For once, I was too optimistic about the box office of a Star Wars movie! As for "Deadpool 2," it will also beat "Solo" in total box office, with Mendelson last week projecting "Deadpool 2" will likely gross at least $300 million in North America. This weekend was a Pyrrhic victory for "Solo," as "Deadpool 2" had a higher opening weekend and will earn more over its run. Liefeld was right! Mendelson managed to see the silver lining of "Solo" disappointing at the box office. Let’s play worst-case-scenario ball here and presume that Solo makes exactly $543.2 million worldwide and loses around $300m. That’s presuming a $300m budget, $300m in marketing and then $250m back to theaters in ticket sales. Yes, I’m intentionally overexaggerating here. That still puts the first four Disney Star Wars movies at $5 billion worldwide in pure theatrical grosses on a combined budget of around $1b. That’s still five times the budget in just worldwide theatrical, with no accounting for post-theatrical, merchandise or Disney’s sheer market share advantage. So, let’s cool it on the calls that Disney has ruined Star Wars (they don’t produce the movies, that’s Lucasfilm’s responsibility). And doubly so on the cries for Kathleen Kennedy to be fired (me thinks the cries wouldn’t be so loud if Kathleen’s first name was Kevin). Here’s the good news: Lucasfilm has shown itself, for better or worse, as a company willing to vastly overspend, even on what was supposed to be a glorified one-off, to deliver what they think is the best possible movie. I may take issue with that in some circumstances (King Arthur, Justice League, etc. ), but over the long haul, it is a worthy investment to make sure that none of these new Star Wars movies are aggressively bad. Also, in the realm of good news, the new batch of Star Wars movies has had (presumably) its first real flop via the least artistically justifiable, most explicitly cynical and most comparatively generic offering yet...[O]ver the long run, it is better for a company to take their hits when they play it safe versus then when they color outside the lines of so-called conventional wisdom. In other words, playing it safe backfired. I can live with that. As for its reception at awards shows, I wouldn't be surprised if "Solo" receives a bunch of Razzie nominations but doesn't "win" any of them, much like "Transformers: The Last Knight." On the other hand, I expect "Solo" will still earn ten or so nominations for next year's Saturn Awards, like "Rogue One," but also like "Rogue One," wins few of them. In fact, while I guarantee it will be nominated for Best Science Fiction Film, I think its chances of winning are at best 50-50. Its competition looks to be "Wrinkle in Time" (unless classified as Fantasy), "Ready Player One," "Upgrade" (unless classified as Thriller), "Jurassic World: Fallen Kingdom," "Replicas," "Kin," "The Predator," "Alita: Battle Angel," "Bumblebee," and "Ad Astra." Sight unseen, I think either "Jurassic World: Fallen Kingdom" or the reboot of "The Predator" will be the most likely ones to take the sci-fi crown away from the Star Wars franchise with "Ready Player One" a dark horse in case all three lay an egg. Those are all long-range projections. A shorter range one will be that "Solo" will garner a bunch of nominations at the Teen Choice Awards, but will not likely win any of them, either. Since this is a Star Wars movie, it has good music, if nothing else. Here is The Adventures of Han, the only John Williams composition from "Solo: A Star Wars Story." Tomorrow is Memorial Day. Expect something serious for the first time since U.S. leaving Iran nuclear agreement pushes U.S. oil price above $70 plus driving update for May 2018: Pearl. I have had enough of entertainment for now!